Chalet Arthur compromises of three apartments. 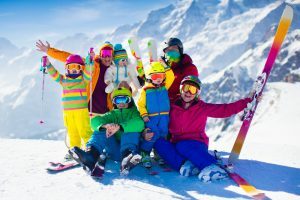 All can be interlinked to provide one big chalet sleeping up to 26 in total, or just One and Three can be connected to provide an 18 bed chalet, or, Three and Two can be linked to make a 17 bed chalet. You receive a 10% discount if you book all three. Chalet Arthur Three is a traditional alpine style apartment with a cosy feel and plenty of lovely features. It is a compact property and the space is well used to make it a comfortable property for groups of up to eight or nine. The first floor entrance opens up into the living, dining and kitchen area. The kitchen is fairly modern and equipped with everything you need and the dining area has a lovely large table. From this area there is also a balcony that over looks the pistes of Pleney and the spectacular surrounding mountains. There is a family bathroom on this level and another shower room. and there is also a double bedroom which includes a shower and a wash basin. Up the staircase and onto the next floor there are three bedrooms and a w.c.
Chalet Arthur Three is in a fantastic location right near the base of the new gondola at Le Pleney. This area is the main access to the Morzine and Les Gets ski area. This perfect location means you are minutes away from catching that bubble and getting fresh tracks before anyone else. All the ski schools and the club Piou Piou also meet at the bottom (or top) of this lift. From Pleney you can also catch the little road train which goes directly across the village to the Super Morzine gondola. This provides ski access to Avoriaz and beyond, deeper into the Portes du Soleil. There is also the main ski bus stop a few metres from the apartment. This again provides many options to reach all the key lift stations in the area. We loved our stay in Chalet Arthur Three! 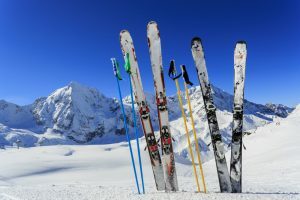 The location is brilliant, one minute from the Pleney lift and ski hire shops and surrounded by a great choice of bars and restaurants. There’s also a great view from the balcony of the red run that brings you back to base. The apartment itself is very clean and cosy, nicely decorated and has everything you need. It was just right for our family party of 8. Communication with Ben and Beth, their airport transfer service and the cleaning team is excellent, with all enquiries dealt with promptly. 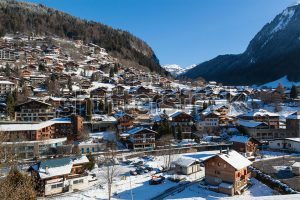 We have been to Morzine six times and this is the best apartment we have stayed in... fully recommended! Thanks for the lovely stay we really enjoyed it, great chalet location and good support from yourselves and Keith. Thanks again we would recommend you and stay again in the future. Great communication, Ben very helpful and accommodating. Accommodation clean and comfortable and in an excellent location. Great value for size of party and location. Our experience of Alptitude is that its run very efficiently and would definitely use again. We stayed in Chalet Arthur 3 from 20-27 Mar 16. When we first arrived, we were welcomed and run through the property, which was very clean and tidy. There was also a welcome pack of essential supplies, meaning we didn't need to rush to the shops. There was plenty of space for the 6 of us and it's biggest selling point is it's proximity to the slopes (30m) and the centre of Morzine. Everything we needed was in the apartment, including bedding and towels. I would thoroughly recommend this apartment and the team at Alptitude for arranging everything. Location was great. Around 50m from the cable car up the mountain, ski hire shop across the road and supermarket and pastry stores within 5 minute walk. Half a dozen restaurants all within 2-5 minute walk. Unfortunately little snow in Morzine when we went, but we jumped on the bus to Avoriaz which was only a 15 minute trip. Again, bus stop is about 50m from the front door. When travelling with 3 children convenience is key and this chalet and its location had everything. In relation to the chalet itself, it was clean, dust free, kitchen was well equipped and wifi access was also great. We could have used a bit more storage space to unpack more from our suitcases, but in saying that we still made do. All up, very happy with our stay, would highly recommend and would visit Morzine and use Ben and his team again. I booked for my a special birthday. Ben was excellent in arranging and ailing promptly with the booking. My family were very impressed with the standard of accommodation and the locality and are booking for next year. Excellent value for money as we go every year as we have friends that live there. Thank you Ben and your team for making a special birthday so special!